1.1 How Much Does Deck Cleaning Cost? 1.2 Can't I Just Power Wash My Own Deck? Spending hundreds of dollars in wood replacement for your deck is one of the least fun projects to do on the residential home improvement checklist. By trusting us to power wash your deck for you, ﻿yo﻿u'll quickly get rid of any worry that the project won't be done the right way. All that's left to do now is enter your first name and email below to start your free estimate online. How Much Does Deck Cleaning Cost? Many homeowners think it's less costly to rent a power washer and spend the day pressure washing than it is to hire a power washing company for their home. But when you consider the cost of deck cleaning solution, plus the chance you'll strip the wood, it may be more affordable to let a professional handle it for you. Plus, you get to kick back and relax while watching us do all the work! How much does residential deck washing cost? It depends on the area, of course. We discuss how to find power washing costs in your area on our house washing page. It's important to delicately power wash your deck using soft wash so you don't risk damage. Can't I Just Power Wash My Own Deck? Head over to the power tool rental shop, toss the clerk $100, then head home, fire that baby up, and go to town! The neighbors are gonna be jealous! Unfortunately for many DIY homeowners, the reality of power washing your deck couldn't be further from the example above. Especially if the deck is wood and you're not using the soft wash technique (which most rented power washers do not offer). You don't need to choose Now Powerwash to clean your deck of dirt, grime, and mildew build-up, but if you do it yourself, please make sure you don't use a high pressure machine that will put your deck at risk. First, click here to tell us about t﻿he dirty deck. Is it wood? A vinyl deck? How big is it? Next, choose your most convenient time for us to swing by for an estimate. 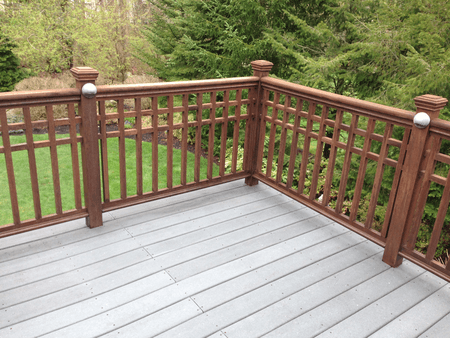 After that, you'll have an estimate locked-in for the rest of the year so all you have to do is call us back when you want us to come out and make your deck look new again! Deck pressure washing is for you if your wood deck or synthetic deck feels worn down and faded. Power washing your deck is recommended before staining.